It excels at sustained throughput and boasts features that help compensate for vibration. There's something about 12TB hard drives reading and writing at 250MBps that we just can't get enough of. This go-round, we review Seagate's IronWolf--the slightly slower, slightly lower-rent cousin to the mighty 12GB Seagate BarraCuda Pro we recently took for a spin. Game of Thrones moniker aside, the IronWolf is still easily fast and enough, and should be reliable enough to make sense in the multi-drive setups for which it's intended. While the 12TB IronWolf falls a hair off the performance pace set by the 12TB BarraCuda Pro, it adds vibration detection (in the higher capacities) which Seagate says will ward off tracking issues when you pack two or more drives together in close proximity. Now for the bad news: The IronWolf comes in at around $480, so you’re talking nearly $1000 for the mirrored pair you should be running them in. Of course, I distinctly remember driving 60 miles and paying $700 for a 4GB SCSI drive once upon a time. Maybe that's not so bad after all. 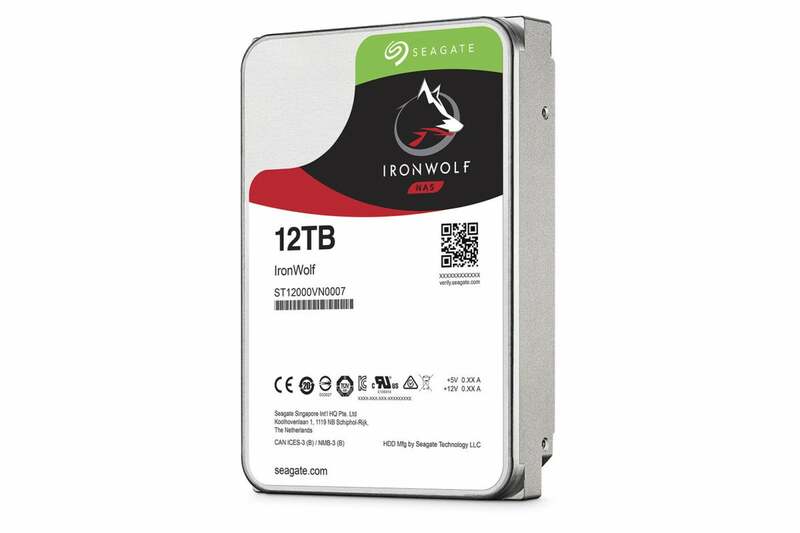 The IronWolf 12TB is a 3.5-inch hard drive rotating at 7,200rpm with 256MB of onboard cache. Its interface is SATA 6Gbps, and it uses PMR (Parallel Magnetic Recording). The drive is filled with helium to reduce drag on the spinning platters. The unit draws 7.8 watts—a relatively small amount of juice for a hard drive. For some reason, the 8TB version draws another watt, while the 10TB draws the same, and the 4TB and 6TB versions draw less. If you delve into the specs, you'll notice some differences between the plain IronWolf and IronWolf Pro versions. Most saliently, the startup voltage is slightly different, as well as the acoustics, with the Pro being rated 0.7db louder. Seagate told me both the power draw and acoustic differences have to do with the power being applied to the head assembly. More power, faster startup and movement, more noise. The plain IronWolf we tested is warrantied for three years and “only” 1 million MTBF and 180TBW. It also lacks the two years of free recovery service included with the IronWolf Pro and BarraCuda Pro. Seagate did confirm that the heads and media that test higher go in the more expensive drives, hence you'll see a slight step down in performance in the IronWolf. We'll be using the IronWolf daily for the near future and we'll let you know if there are any problems, or not. We don't expect any. We tested the IronWolf 12TB using both the AS SSD and CrystalDiskMark synthetic benchmarks. To verify the results, we followed up with real-world copying of a single large 20GB file and a 20GB mix of smaller files and folders to and from the platters. Even though we’d already tested the BarraCuda Pro, which outpaces the IronWolf by a few percentage points, it was still a hoot to see large amounts of contiguous data transfer at 250MBps. IronWolf's not-quite-as-fast is still darn quick. 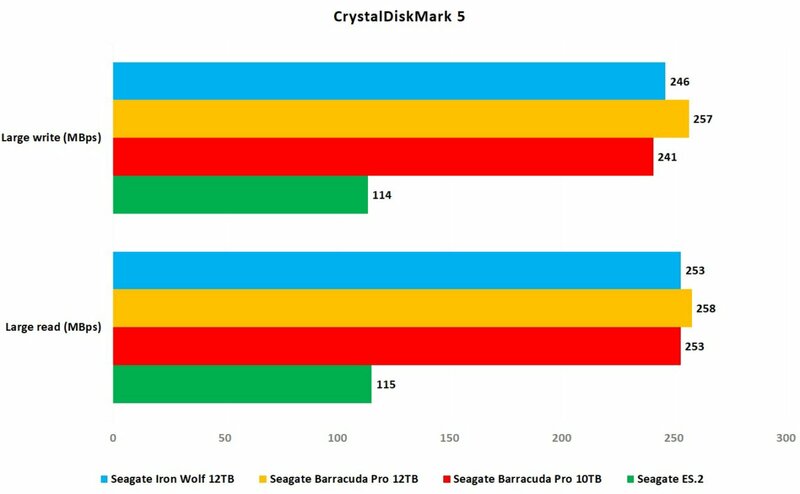 As far as CrystalDiskMark 5 is concerned, the IronWolf and BarraCuda Pro might as well be the same drive. 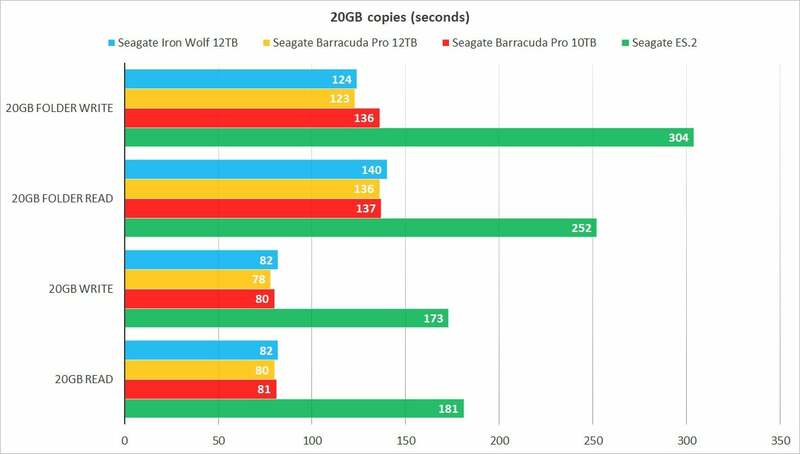 AS SSD actually rated the IronWolf as writing faster than the BarraCuda Pro. We generally trust its results, but it does spit out the occasional odd numbers. Note that AS SSD issues the FUA command, which disables all write-caching for the drive, including any done by Windows. That could have affected the result. 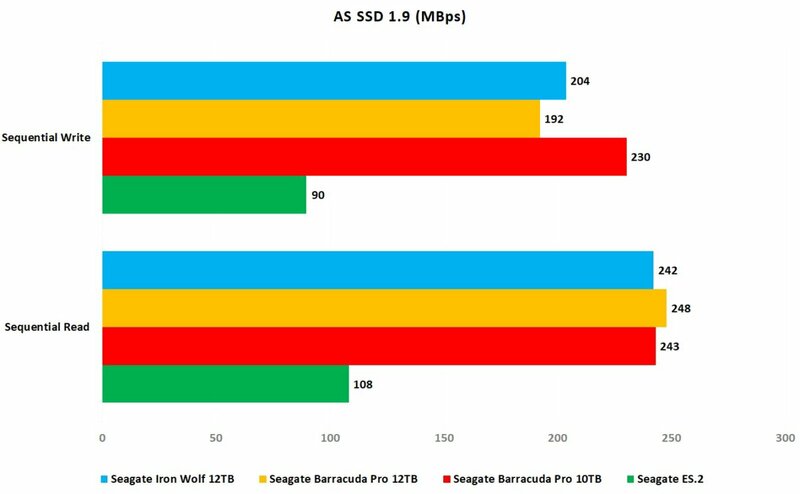 The IronWolf's write performance in AS SSD was 40MBps slower than the BarraCuda 10TB, but we're still trying to understand the BarraCuda 12TB's sudden drop in write speed. Take these numbers with a grain of salt. Also, as with all hard drives, transfer rates vary according to where you are on the platter. As the outer sectors are filled, and more data is written to the inner regions of the drive, speeds may drop. With the relatively small amounts of data we wrote, this phenomenon won’t show up. There wasn’t a lot to choose from in our 20GB copy tests, with the IronWolf reading and writing a tad slower than the BarraCuda Pro. Of course, it still blows away the vintage Seagate ES.2 1TB, which offers performance more in line with what the average user is accustomed to. The IronWolf 12TB was only slightly slower than its Barracuda cousin in our copy tests. The ES.2 shows the kind of slow sustained performance many users are used to. We didn’t test the lower-capacity 1TB through 10TB IronWolf drives, but Seagate’s performance claims decrease progressively with each drop in capacity. On the other hand, the company lists only 210MBps for the 12TB model we tested, not the 250MBps we saw. You might see better-than-claimed performance with the other capacities as well, depending on your computer. Note that while the sustained throughput of these hard drives is closing in on the SATA 3Gbps SSD level, you’re still talking relatively slow access times. Where SSDs regularly take only a tenth of a millisecond, these hard drives take the better part of a millisecond at best, and several milliseconds at worst. In other words, they’re great for moving large amounts of data on and off their platters, but you’ll never get that snap running your OS off of a hard drive that you will with an SSD. Note that we did not spot any statistically relevant difference in the seek times between the BarraCuda Pro and the IronWolf. Please note that the 1TB through 4TB IronWolf drives spin at 5,900 rpm rather than the 7,200 that the larger capacity drives spin at. And only the 4TB drives and above sense and compensate the head assembly for vibrational factors. Also, the 4TB and larger drives feature Seagate's IHM (IronWolf Health Management), which interfaces with NAS boxes from Synology, Thecus, and AsusStor (with more vendors on the way) to provide extensive monitoring of the IronWolf's vital signs. the 1TB and 2TB models do not. 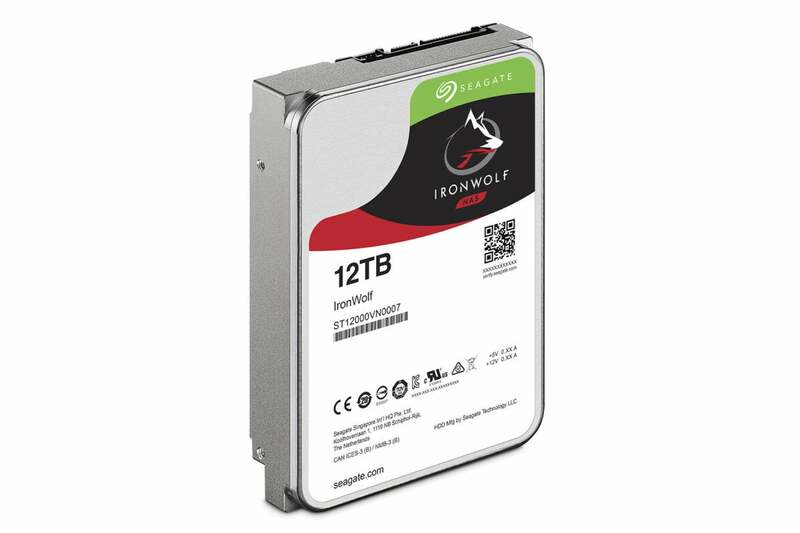 Why there's variance in the feature set within the same product line we can only guess at, but if you're looking for a 1TB or 2TB drive, just be aware that the full array of IronWolf perks are not present. The IronWolf Pros all have the full feature set, with the exception of the 1TB model, which lacks vibration sensing. The IronWolf 12TB is a great drive. But if you’re planning to fill a 12TB drive with data you can't easily recreate or recapture, you’re best off biting the bullet and doubling down on a pair of them, as I said up top. Along with the soon-to-be-reviewed 12TB WD Enterprise Gold, it's the least expensive 12TB option out there. If on the other hand, most of what you'll be storing is replaceable, you can get away with a single 12TB drive if you simply use standard methods to back up the irreplaceable data. That said, in the single drive scenario, spending a few more bucks for the higher-reliability BarraCuda Pro or IronWolf Pro with their higher ratings and two-year recovery plan might be in order. 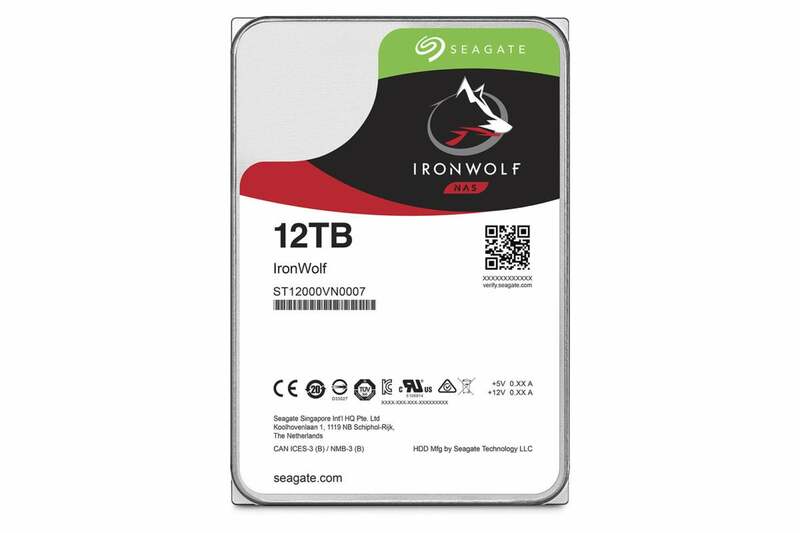 With tons of capacity and very fast large file copies, the Iron Wolf is Seagate's more affordable option in high-capacity hard drives. Also featuring vibration detection and compensation, it's great for NAS boxes. But it lacks the two free years of Seagate's recovery service and is rated for a slightly shorter lifespan than its BarraCuda Pro and IronWolf Pro cousins. Buy accordingly.